A blind street singer on a fog-shrouded corner gives an ominous warning to 3rd Officer Tom Merriam, about to embark on his first voyage aboard the S.S. Altair, captained by veteran sailor Will Stone. Stone is stern but friendly, eager to teach Tom the ways of the sea, and implement his view’s of the captain’s authority. A crewman dies just before they’re about to set sail, victim of an apparent heart attack, and Stone, claiming “he was an old man”, launches without a replacement. 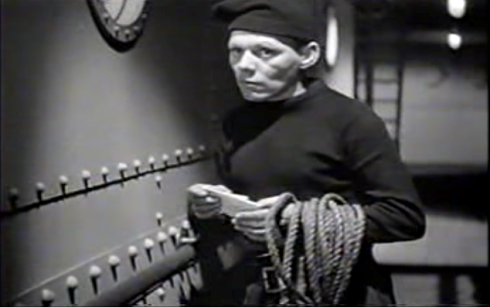 A freshly painted grappling hook is left unsecured by the captain’s orders, despite Tom’s protestations. When the Altair hits rough seas, the crew risk their lives to secure it, and Tom learns his first lesson about questioning the captain’s authority. When another sailor has an appendicitis attack, radioman Sparks puts in a ship-to-shore call to a doctor. Stone is unable to perform the delicate operation, and has Tom take over. Loyal officer Tom gives Stone the credit, as the captain explain he has the power if life and death over his men. We can see the cracks in Stone’s armor are beginning to show. 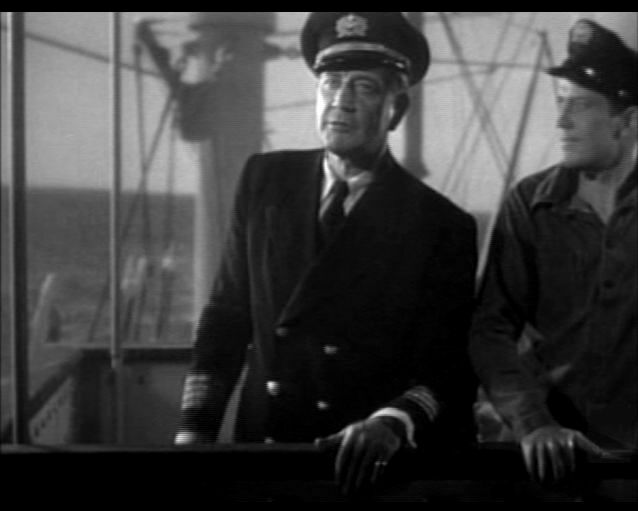 Crewman Louie (an uncredited Lawrence Tierney ) dares to question Stone’s authority when he complains about being down two crewmen now. Stone once again offers an explaination for his actions, telling Louie before he leaves, ” There are some captain’s who’d hold this against you”. 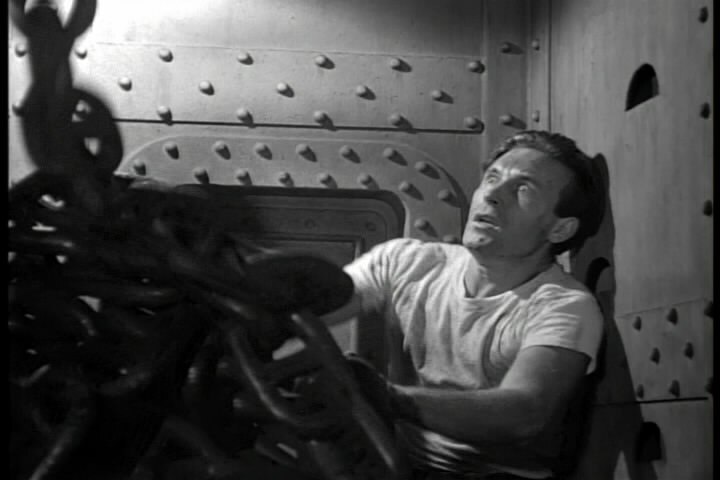 Later, Louie is down in the hold as the crew drop a massive chain down, and Stone locks him in, causing the sailor to be crushed to death. Tom sees him below, and accuses him of deliberately killing Louie. An inquest is held at the port of San Sebastian, and the sailors all side with the captain, even ‘The Greek’ who praises Stone for saving his life during his medical crisis. Tom is crestfallen and plans on leaving the Altair and settling up in San Sebastian. 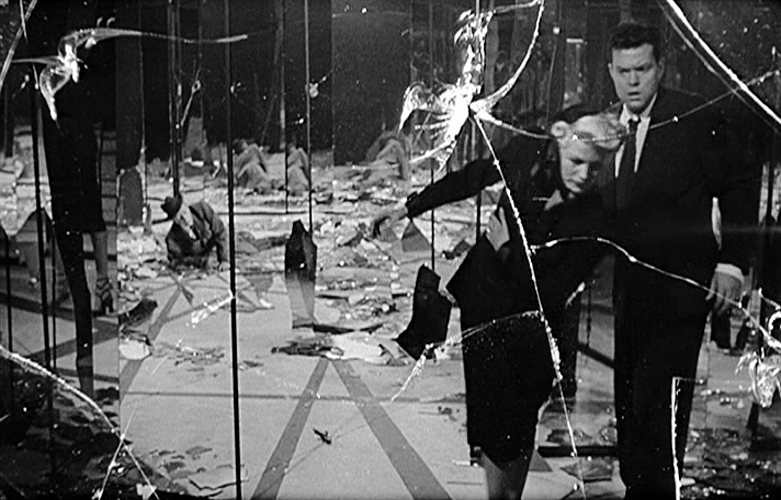 The horror is strictly psychological here, there are no demons, zombies, or cat people, only the psychotic Captain Stone. 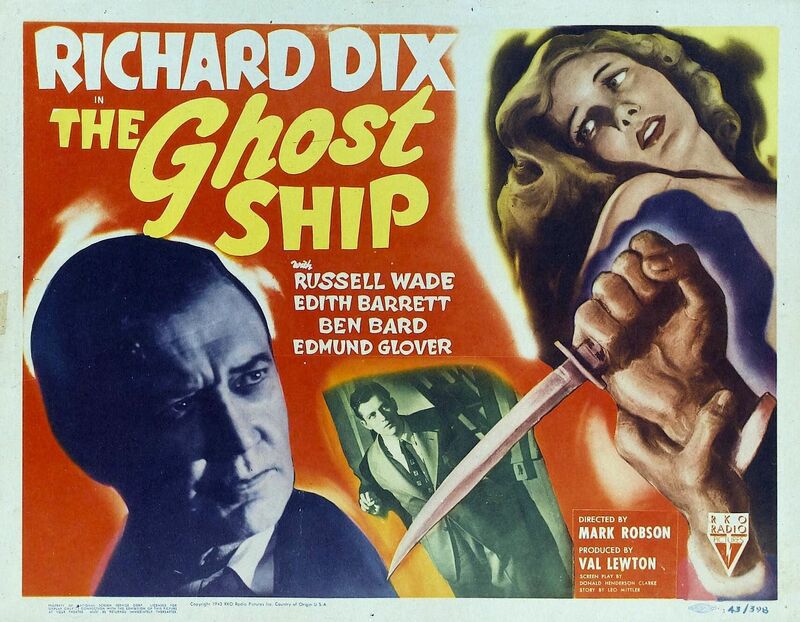 Veteran actor Richard Dix (the Academy Award winning CIMARRON, THE WHISTLER series) gives a Queeg-like performance as the sea captain slowly descending into madness. Russell Wade(THE BODY SNATCHER) is fine as Tom, and Lewton regulars Edith Barrett (the only female in the cast), Ben Bard, Dewey Robinson, and calypso singer Sir Lancelot are also in the cast. Nicholas Musuraca’s cinematography is outstanding as always, and Mark Robson’s direction keeps this GHOST SHIP taut with suspense. 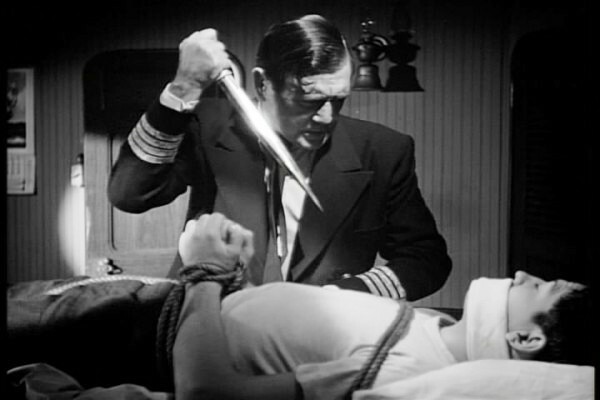 Most readers are familiar with Lewton’s greatest hits, but this quiet, gripping little film is worth seeking out. While GHOST SHIP isn’t out-and-out horror, I think you’ll find it quite a treat for your Halloween movie basket. Nicely done on this overlooked gem. Previous PostPrevious Halloween Havoc! : Bela Lugosi Meets The East Side Kids… Twice!